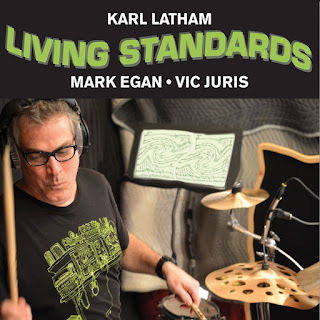 Jazz Station - Arnaldo DeSouteiro's Blog (Jazz, Bossa & Beyond): Fusion CD of the Month - "Karl Latham, Mark Egan & Vic Juris: Living Standards"
Fusion CD of the Month - "Karl Latham, Mark Egan & Vic Juris: Living Standards"
Karl Latham’s latest release, "Living Standards" features bassist Mark Egan and guitarist Vic Juris performing iconic pop standards from the ’60s and ’70s. The trio, led by world renown drummer Latham, takes you on an adventurous jam band/jazz journey, exploring smash pop, rock and soul hits that have become modern standards, overlapping generations of listeners. Karl’s latest trio follows the critically acclaimed Egan/Latham/Hart "Unit1" and Latham/Carniaux/Egan "Constellations," a fantastic jazzy tribute to Bjork. With the inclusion of virtuosic guitarist Vic Juris, "Living Standards" clearly draws from the interpretive spirit of those above mentioned albums providing a rhythmic and harmonic adventure in a vehicle of iconic pop standards. Featured tracks include The Beatles' “Day Tripper”, “Tax Man” and “Tomorrow Never Knows”, Neil Young’s “Cinnamon Girl”, stirring ballads “White Rabbit” and “Us and Them” and extended improvisations on the Doors “Riders on the Storm”, and the War classic “Low Rider”.